Attend matriculation in person on Monday 24 September. If you are unable to attend, please come into the AAS office as soon as possible to matriculate in person. 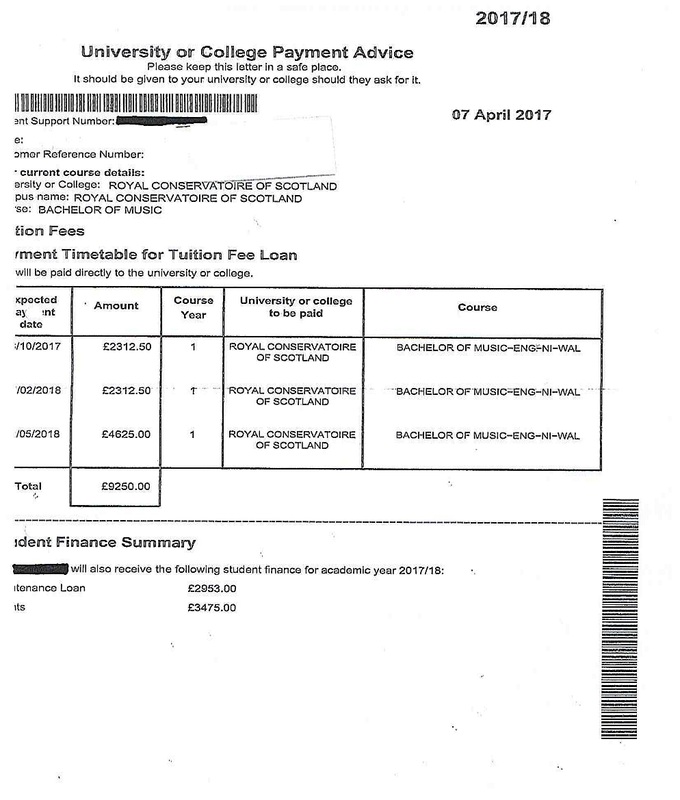 Please complete the Payment of Fees Form 2018 and return to Craig Wardlaw at c.wardlaw@rcs.ac.uk. Information on how to pay fees is on this form. 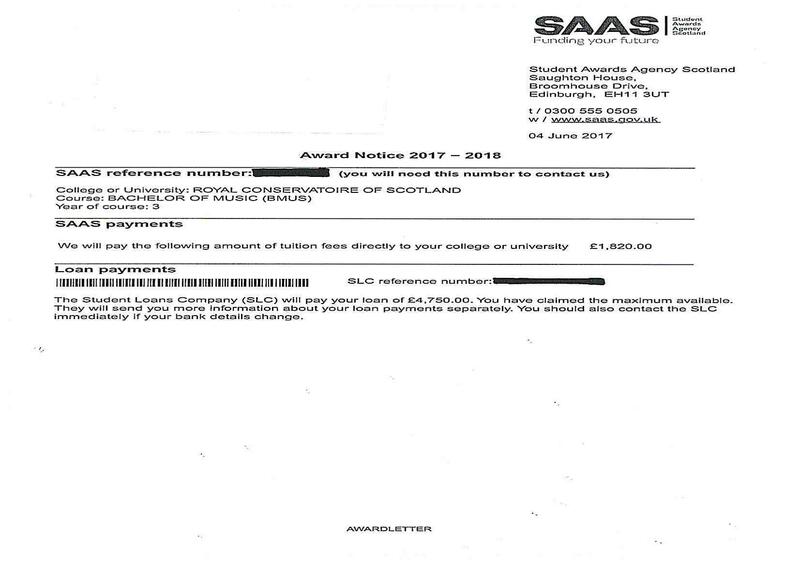 If you are funded by SAAS or Student Finance England/Wales/Northern Ireland, please provide a copy of your award letter. 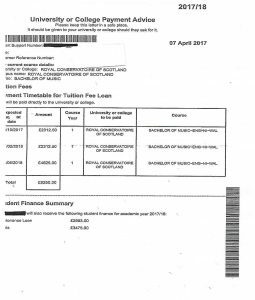 We need both the award letter confirming fees payable to the Conservatoire and any loan disbursement letter from the Student Loans Company. If you have applied for a student loan and have provided the Student Loans Company with your bank details and all documents required, your loan will be paid directly into your account, provided that you have completed the matriculation process and provided the Conservatoire with your award letter and letter confirming your loan. Please allow 5 working days for this payment to be processed to your bank account, from the start of term (24 September). If you have been successful in receiving a scholarship or bursary, you may collect your first term instalment cheque from the finance office the day after you have matriculated. You must also bring your scholarship / bursary letter to matriculation. Incoming Erasmus, International Exchange or Study Abroad students do not need to complete the Payment of Fees Form. Photo ID – Passport/Driver’s Licence. 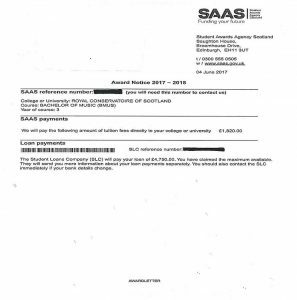 Your letter of award from SAAS or Student Finance England/Wales/Northern Ireland if not previously sent. Original qualifications on entry (ie transcripts/certificates) if you have not sent this in previously. Student Loans Company letter if relevant. Biometric Resident Permit (BRP) and your passport with 30-day vignette (applicable for international students). MEd and PgCert students do not need to come in person to matriculate. Please complete online matriculation. If you are unable to attend matriculation, please can you email matriculation@rcs.ac.uk. Please note that failure to matriculate will result in late matriculation fee of £25. Persistent failure to complete the matriculation process will result in the discontinuation of your programme of study. If you do not have evidence regarding payment of fees or not paid your fees if you are self funded. If you have an outstanding PVG check (only applicable for BEd and CPP students). If you have not provided evidence of your educational certificates. Failure to confirm arrangement for the payment of fees or to produce the required documentation (by 21 October) will result in your student card being deactivated. Persistent failure to complete the matriculation process will result in the discontinuation of a student’s programme of study. If you have any queries, please do not hesitate to contact us on matriculation@rcs.ac.uk or phone 0141 270 8265. Craig Wardlaw from Finance can be emailed at c.wardlaw@rcs.ac.uk.